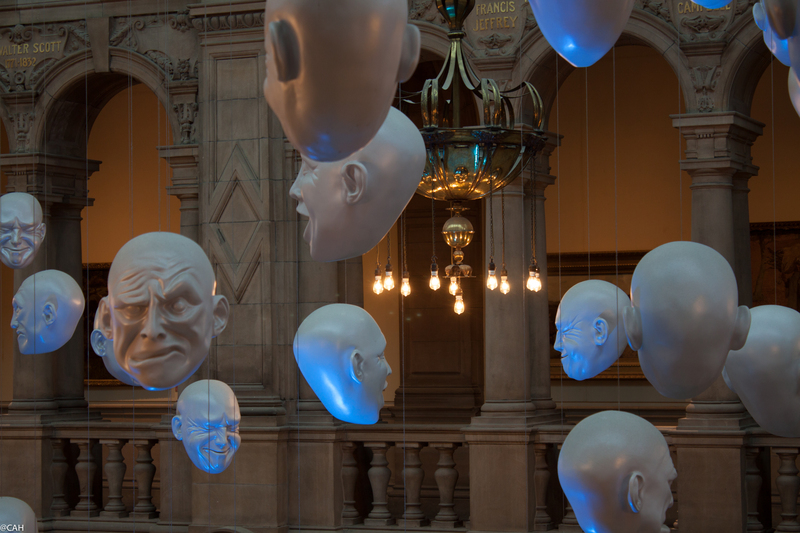 and an interesting installation based on white human heads with various facial expressions, suspended from the roof and illuminated with different coloured lights in sequence. When I took this shot, they were blue. 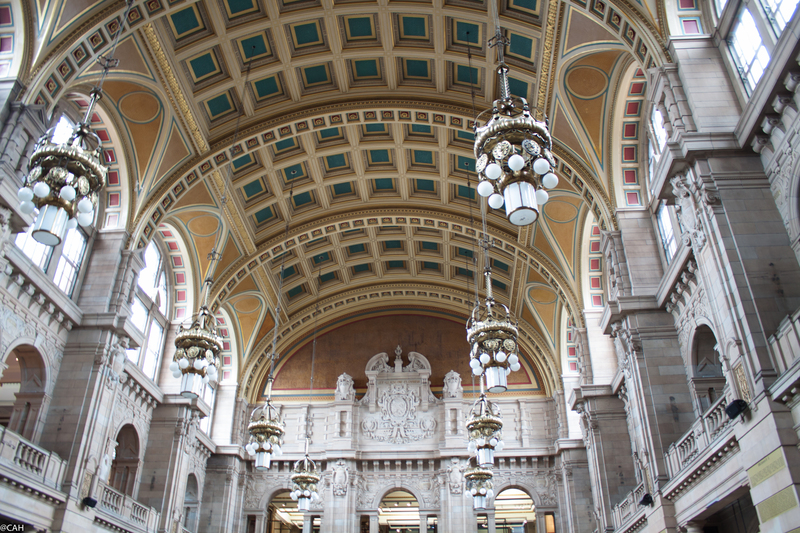 We wandered round the galleries devoted to the Glasgow Boys, The Scottish Colourists and Charles Rennie Mackintosh. 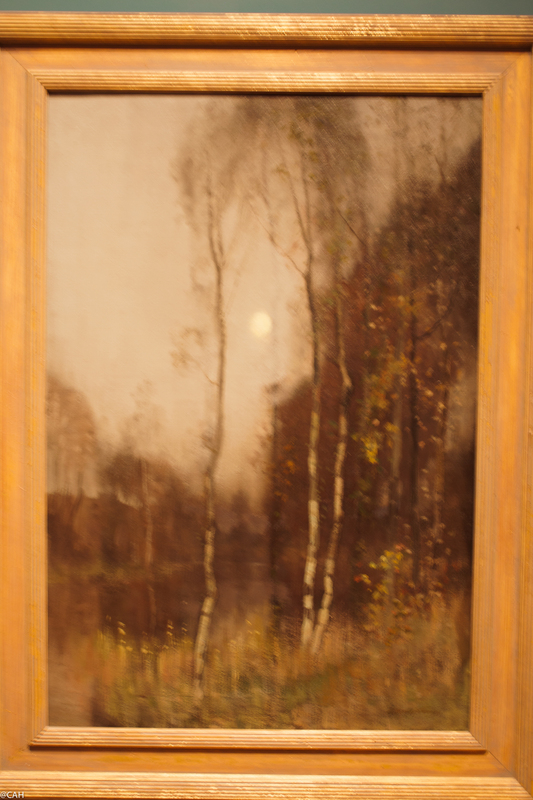 This painting,’Moonrise’ by Macaulay Stevenson who was one of the Glasgow Boys, reminded me that I have been thinking of a painting based on our silver birches (we have 21 in the garden) for a while and need to decide what I am going to do. Another painting of an Edinburgh tenement by JD Fergusson prompted the thought that a painting of the Edinburgh tenement that we started our married life in and one of each of our homes since, might be a project. Afterwards, I had hoped to ferret in the Oxfam bookshop in Byres Road but it was closed for refurbishment. Happily, the music shop was open and we expanded our collection further. All too soon it was time to head home after a coffee stop with a friend in South Lanarkshire and join everyone else heading south. The traffic jams and diversions were enlivened nearer home with spotting interesting cars coming in the opposite direction. They had been at CarFest North and were now heading home. We might be heading there next year as James and my friend will love the cars and we will all enjoy the music. Interesting installation on the human head.